Il reste 82 objets. Veuillez saisir un nombre inférieur ou égal à 82. Un paiement immédiat de 13,49 $C est requis. This is a great product and does exactly what it claims to do. I would highly recommend this product to anyone who wants a consistent and foul-proof way of obtaining a proper cure and moisture content. Product works as advertised. Very happy with its performance, maintains the humidity stated on the package. great little pks for keeping herb slighty moist work great. A perfect fit for my Travel Humidor. 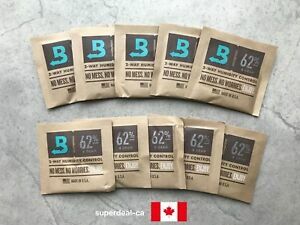 Also, Boveda Humidity Packs are bi-directional: they can actually remove moisture from a humidor that is too moist and then maintain the relative humidity written on the pack.